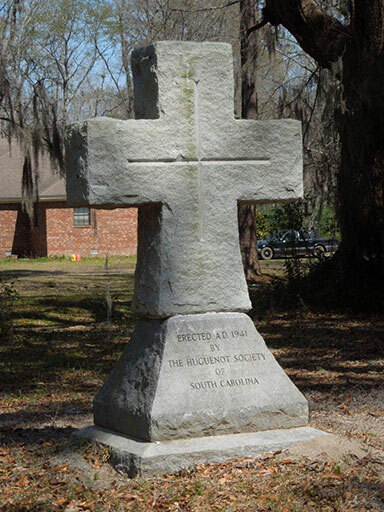 During the early and mid-1900s, the Society erected five granite crosses to mark the sites of the Huguenot settlements in South Carolina. The five Cross sites, each a one-acre tract deeded to the Society and known as God’s Acre, are located in Goose Creek, Orange or French Quarter, French Santee, Purrysburg and New Bordeaux. The sites commemorate the original settlements of our ancestors who came to Carolina seeking religious freedom. The French Protestant (Huguenot) Church of Charleston commemorates those newly arriving settlers who remained in Charles Towne, beginning with the arrival in 1680 of some 92 refugees on the Richmond, a British man-of-war. For more information on the church, go to www.huguenot-church.org. The Goose Creek Cross Site commemorates the settlers who founded a French Church in what today is Ladson, SC, near the headwaters of Goose Creek. This was probably the third site settled by Huguenots in Carolina, beginning c. 1682. As late as the 1940s there were standing tombstones on this site. The French or Orange Quarter Cross Site was probably the second settlement chosen by arriving French immigrants in 1680. They originally owned the land where the Anglican church of Pompion Hill on the east branch of the Cooper River stands. As English settlers moved into the area, the French became concentrated on Lynch’s, now French Quarter, Creek, some miles to the south. The French Santee Cross Site marks the fourth French settlement outside Charles Towne in Carolina . It is located on a 25 foot high limestone bluff above the Santee River at the site of Jamestown, founded by a small scouting party of French refugees who sailed up the river in January, 1687. Most of French Santee is now part of the Francis Marion National Forest and the land, river and creeks look similar to what our forefathers and mothers saw as they searched for home sites. The St. John’s Berkeley Cross Site represents St. John’s Berkeley which was settled before 1700 by French Protestant refugees, some of whom had first settled in Orange Quarter and French Santee. They built a small wooden building on the site which served the congregation of about ten families until they began worshipping at Pooshee Plantation. The cross commemorating St. John’s Berkeley is located near Simpson’s Crossing not far from the waters of Lake Moultrie which inundated the lands once owned by members of the congregation. The Purrysburg Cross Site represents the town of Purrysburg, founded during the 1730s by Protestants from France and Switzerland who hoped to establish viniculture. The settlement grew for some years, but did not prosper. The graveyard surrounding the Purrysburg Cross is maintained by local residents. The New Bordeaux Cross Site commemorates the last large group of French Protestants to arrive and settle in South Carolina. Led by the Rev. Jean Louis Gibert and the Rev. Jacques Boutiton, some 371 French, Swiss and German immigrants sailed into Charlestown harbor 12 Apr 1764, a day short of the date the Edict of Nantes had been signed 166 years previously. Their plans for viniculture and sericulture did well until financial considerations, political intrigues in England and France and the coming American Revolution ended them.